Margaret Jane Harrison Tittiger, 90, of Brunswick, MD passed away on Saturday, October 15, 2016 at Northampton Manor. Born December 16, 1925 in Sandy Hook, MD she was the daughter of the late Charles and Katherine( Taulton) Harrison. Margaret was the oldest original member of Sandy Hook United Methodist Church, joining January 30, 1930. 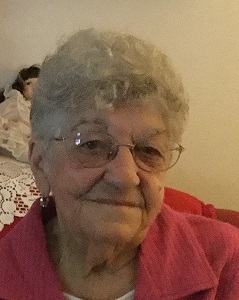 She was also a member of the Ladies' Auxiliary for the Brunswick Volunteer Ambulance and Rescue Squad and a member of the Pocahanus Lodge, Pythian Sisters, Redman Club and the Fraternal order of the Eagles. She was a longtime member of the club at the Brunswick house, serving as secretary and treasurer for 20 years. Margaret also enjoyed bingo. She is survived by her son Charles Harrison (Esther Bathgate) of Glen Burnie; cousins Margaret and John "Bobby' Harrison, Frances Randall, Mary Nutter. She will also be missed by her special friend Donna Coulter and her friends at the Brunswick House. The family will receive friends at the Stauffer Funeral Home, 1100 N. Maple Ave., Brunswick, MD Friday, October 21, 2016 from 3-5PM and 7-9PM. Funeral services will be held on Saturday, October 22, 2016 at 1PM. Pastor Doug Fraim will officiate. Interment will follow at Country Cemetery formerly Vert's and Miller Cemetery.